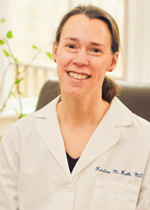 Dr. Kristina Rath graduated from Yale University with a Bachelor of Science in Mechanical Engineering. She earned her medical degree from the University of Pittsburgh Medical School where she was elected to the Alpha Omega Alpha Honor Medical Society. She completed her internship and residency in Obstetrics and Gynecology at Yale-New Haven Hospital. Dr. Rath has worked in private practice obstetrics and gynecology in the New Haven area since 2001. She is a Clinical Instructor in the Department of Obstetrics and Gynecology at Yale University School of Medicine. She is a Board Certified Diplomate of the American Board of Obstetrics and Gynecology and a Fellow of the American College of Obstetrics and Gynecology. Dr. Rath is the mother of three young children and an avid runner. She has raised over $160,000 for the Children’s Tumor Foundation as a member of the NF Endurance Team.